Welcome to the twenty-eighth installment of the Haunted Montreal Blog! Released on the 13th of every month, the August 2017 edition focuses on research we are carrying out into the allegedly-haunted McGill University Faculty Club. Haunted Montreal is also pleased to announce that our public season is now in full operation, with ghost tours in Griffintown on Friday evenings and on Mount Royal on Saturday nights! We are also happy to announce our extensive plans for the 2017 Hallowe’en Season! To receive a new Montreal ghost story on the 13th of every month, please sign up to our mailing list on the right of the screen. 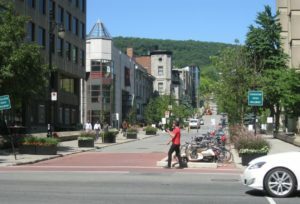 McTavish Street on McGill’s bustling campus is said to be the second most haunted street in Montreal, after Saint Paul Street in Old Montreal. There are said to be no less than three haunted buildings on this street: Duggan House, the McLennan Library, and the McGill University Faculty Club. The Faculty Club welcomes the school’s elite of professors, deans, provosts, and other academics. The opulent mansion is a private oasis on the bustling campus, a place where academics come to relax, dine, socialize and discuss important matters. However, according to many sources, the Faculty Club is haunted by ghosts of the past. The opulent mansion was designed in 1886 by Baron Alfred von Baumgarten, a wealthy German sugar tycoon for his family. Baron Alfred Moritz Friedrich Baumgarten, Ph.D., was born in Desden in 1842. After studying chemistry at the University of Berlin and the University of Göttingen, he came to New York City in 1866 intending to do business in the North American chemical industry. 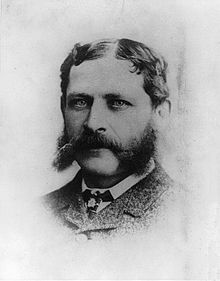 In 1873, Baumgarten moved to Montreal to manage the de Castro Syrup Company, and in 1879 he co-founded the St. Lawrence Sugar Refining Company. The company imported raw sugar from the British West Indies and Europe before refining it into pure sugar, which could be sold to local and international consumers. At first, the enterprise was relatively small and located on the Lachine Canal. However, with increasing demand, the plant was enlarged several times until the original buildings were destroyed by a fire in 1887. 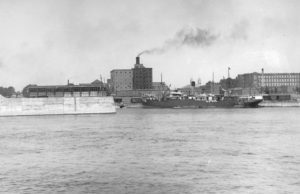 A new factory was built in the City of Maisonneuve, now a Montreal neighbourhood, on a riverfront site that allowed large, sugar-filled steamships to deposit their cargo directly at the facility. By 1908, the company was valued at five million dollars and exported 300,000 barrels annually. Needless to say, the enterprise made the Baron extremely wealthy. He spared no expense on his lavish home, located in Montreal’s posh Golden Square Mile, which was replete with detail and decoration in its sumptuous interior. 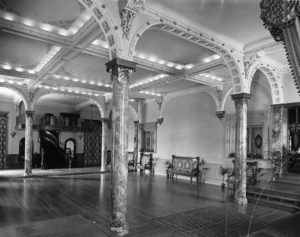 With a taste for the extravagant, the sugar king added one of Montreal’s first indoor pools, the first electrical lighting system in a private residence and a lavish ballroom to better introduce his daughters, Mimi and Elsa, to society. To ensure their chances of finding good husbands, Baumgarten spring-loaded the hardwood floor of his ballroom in order to make dancers, his daughters included, appear lighter and more nimble on their feet. The house also boasted high ceilings, elaborate carvings and a big fireplace. A Gothic Gallery, which spanned two stories of the house, was made to resemble a German hunting lodge. An immense, amber-coloured stained glass skylight capped the beautiful chamber. Opulent and beautiful, Baumgarten House was seen as an ideal location to entertain the city’s wealthy elite. By the turn of the century, the Baumgarten house was a center of social activity. Indeed, it was the Governor-General’s favorite place to visit when he came to Montreal. 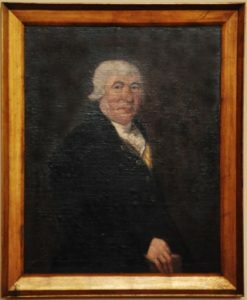 By the 1910s, Baumgarten had established himself as one of the city’s most prominent citizens and he entertained people who held some of the most esteemed positions in the society. However, trouble started brewing for the Baron as the First World War approached. 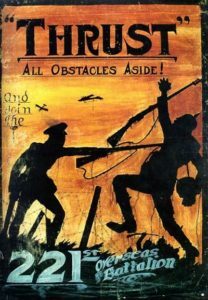 Anti-German sentiment began to spread through the British Empire and once the war had started, hysteria reached its peak. The St. Lawrence Sugar Refinery, where many of the main shareholders were of German origin, was accused of being ‘in the hands of the enemy’. Every shareholder with a German-sounding name, Baumgarten included, was bought out. He was also forced to resign from all positions connected to the firm. After losing his position and much of his standing in the city, many of his former associates began shunning him personally. 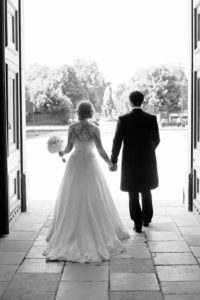 He began to fear that his daughters would never get married. The downtrodden Baron became very sad during the war, and despite offering his Montreal residence as a convalescent home for disabled soldiers returning from the Front, his reputation sank deeper and deeper. He died in 1919, shortly after the war’s conclusion, some say a broken man. While his daughter Mimi never did find a husband, Elsa Baumgarten would go on to marry a man named Reginald Leslie Gault. Following the Baron’s death, his widow continued living in the home with her two daughters until 1926, when McGill University purchased the building for a nominal sum to serve as the principal’s residence. 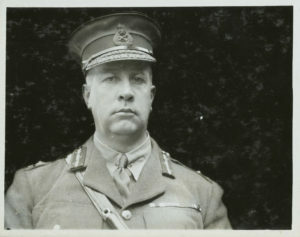 General Sir Arthur Currie was appointed principal and vice-chancellor of McGill University in 1920. Without the benefit of post-secondary education himself, the war hero was given the job due to his “exceptional powers of organization and administration” and his “capacity for inspiration and leadership”. Principal Currie governed the university until his death in 1933, triggered by a stroke and then bronchial complications caused by pneumonia. 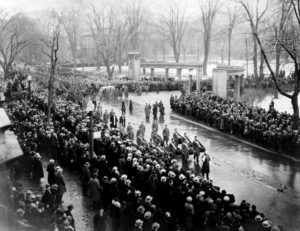 Following an elaborate and well-attended military funeral, a decision was made to repurpose the residence into a club for McGill University’s faculty. 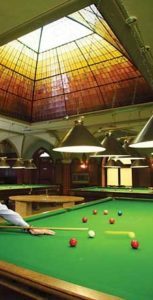 During extensive renovations, the Gothic Gallery was split into two separate floors, the lower one being the main dining room, and the upper floor the billiard room. In 1935, the McGill Faculty Club opened its doors in the old Baumgarten House. Designed as an oasis for the university’s elite, the Faculty Club has since hosted countless receptions, meetings, dinner parties, and academic gatherings, all within the beautiful confines of the spectacular mansion. However, professors and their servants have often felt that there is something amiss within the old Baumgarten House. People often feel uneasy inside the building, especially late at night. Over the decades, there have also been reports of all sorts of strange and paranormal activity unfolding within the Faculty Club. One example is a piano in the basement that sometimes begins to play on its own accord. 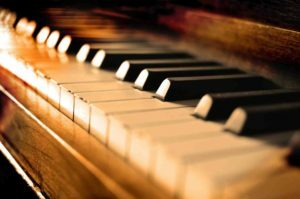 On one occasion, a professor complained that the noise was disturbing an important meeting, so the staff tried closing the piano lid to stop it. When that didn’t work, they covered the piano with a thick blanket and wrapped chains around it. However, the piano continued playing, albeit with a more muffled sound. Then, as though the instrument was angry, it began to play more loudly with notes that were jangled and increasingly off key. The unearthly music got faster and faster and louder and louder before culminating in a loud crescendo. With one last clang, the piano finally stopped. On other occasions the Faculty Club’s phone has called the Human Resources Department late at night, when no one is there. When office staff arrive at HR the next morning, they inevitably call back the Faculty Club to inquire why someone had phoned them so late at night. The servants are at a loss to explain. One night a security guard was doing the rounds and he climbed the spiralling stairs to the second floor. He began to hear loud, banging noises on the second and third floors. He felt a dangerous presence that seemed to be getting closer and closer to him. A wave of panic set in and he froze, paralyzed with fear. The banging noises got louder and more violent and he felt as though the presence was nearly upon him. He snapped out it and bolted back down the stairs, before dashing out of the building into the cool night air. He later told his colleagues that he had soiled his pants on the way down, so terrified was he by his experience. While nobody knows exactly how many spirits are haunting the building, there is some speculation that the ghost of Baron von Baumgarten haunts the place, seeking to restore his reputation through ghostly parties in a paranormal afterlife. This could account for the ghostly billiard matches and the paranormal piano music. 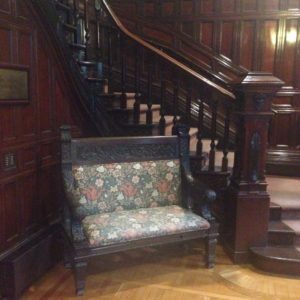 There is also one persistent rumour of a maid who was murdered on the 3rd floor, in what is now the Montreal Room, a private dining chamber that can be booked by faculty members. If the story is true, the murder would have taken place after the home was renovated, because in the original Baumgarten home the 2nd floor was designed to look like a massive hunting lodge with a soaring ceiling. The 3rd floor was only added after it was renovated into the Faculty Club. Whether this alleged murder is the result of overactive imaginations or was somehow covered up remains to be seen. 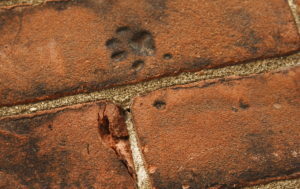 Others believe demonic felines infest the building, as evidenced by paw prints embedded in the northern brick wall of the Faculty Club. Geologists dismiss this theory however, explaining that cats in the past would often walk over hot bricks as they were drying in the sun. 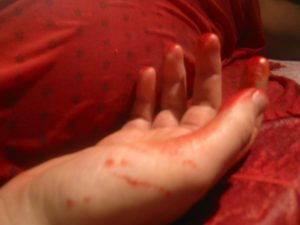 On January 28, 2013, another strange event occurred, which some students blamed on faulty engineering and others on paranormal activity. A water main broke near the McTavish Reservoir above the campus, sending torrents of water gushing down McTavish Street, right past the Faculty Club. It was almost as though some unknown force wanted to cleanse the campus of its human element. 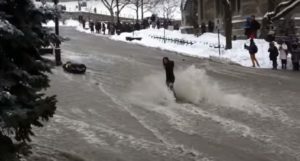 One girl, while attempting to cross the McTavish Street, fell into the raging waters and was sent cascading down the hill, right past the Faculty Club. Was this episode caused by poor engineering or something more sinister? While nobody is certain just who or what is haunting the McGill Faculty Club, only one thing is certain: those who work and play in the old Baumgarten House must share the beautiful mansion with ghosts from the building’s storied past. The Haunted Montreal public season of ghost tours is now open, with Haunted Griffintown and Haunted Mountain being offered in both English and French. From August to October 7, Haunted Griffintown is being offered on Friday nights and Haunted Mountain is on Saturday nights. There are also many extra tours that have been added on Mount Royal in French due to high demand. Our website will be updated soon with the new information. 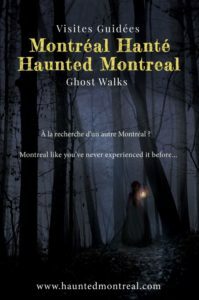 From June 23 to September 4, the Haunted Red Light District Ghost Walk will be offered in English on Sunday nights, in French on Monday nights and in both languages on Friday nights. For the Hallowe’en Season, tours will be offered in both languages every night from Thursday, October 26 to Thursday, October 31. It is rumoured that guests at the trendy Club Le Cinq, located at 1234 De La Montagne, can “enjoy some spirits with a spirit.” Once the site of the Joseph C. Wray & Bros. Funeral Home, the building was used for decades by coroners and funeral directors until being sold and vacated in 1970 and converted into a nightclub. Today, all three floors of the club are reputed to be haunted. Women are warned never to go to the ladies washroom alone lest they encounter the terrifying ghost of lady with a jagged scar running the length of her torso, as though she had received an autopsy. 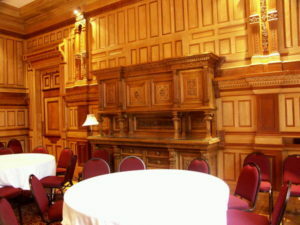 Other frightening paranormal encounters over the years have solidified Club Le Cinq’s reputation as one of the most haunted buildings in downtown Montreal. do you have any tours for november december? Hi, our public season starts again in May, 2018.